Woo! We were tickled pink to come across another academic review of The Other School Reformers. It’s in the (subscription only; sorry) January edition of American Historical Review. the journal of record for the historical profession in the United States since 1895—the only journal that brings together scholarship from every major field of historical study. Its reviews are famous for no-holds-barred nerd attacks. So when we dialed up our library to access the review, it was with some trepidation. Was the author going to rip my book apart? She was Emily E. Straus, author of Death of a Suburban Dream: Race and School in Compton, California, published in 2014 by the University of Pennsylvania Press. Clearly, Professor Straus knows the terrain of schooling, culture, and tumult. I’m happy to report that Straus both understood what I was trying to do and thought I did a good job of it. fills in the shadow figures against whom progressives—a group that historians have written much more about—fought. Excellent. That was my primary driving question in this research. Most of the books that I read in grad school found the progressive side to be the obvious protagonists of educational history. I did, too, but my experience as a high-school teacher made me think those histories were missing a big part of the story. also broadens our understanding of conservatism in the twentieth century by illuminating the centrality of education. 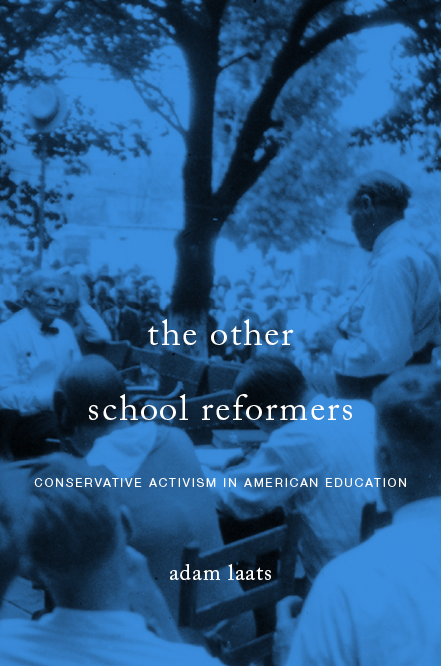 By excavating conservatives’ activism around public school education and by helping to reframe the discourse around education, Laats’s account will enrich both historical and contemporary debates on education and politics. Any scholar interested in how to tell a national story through a local lens will also benefit from reading Laats’s work. Thank you, Professor Straus! You are obviously a scholar of great taste and discernment! Way to go Adam. You beat off another need attack.